We employed large, direct-touch displays wall and tabletop displays to create interactive non-photorealistic paintings, allowing to work with many strokes simultaneously. The essential difference to previous systems is that users can modify strokes even after they have been placed. This is achieved using a hybrid approach that takes the visual richness of pixel images and the flexibility of vector graphics. The implementation is based on the Display Framework that from the Innovis research group at the Interactions Lab of the University of Calgary. To enable a broad range of users to interact expressively and intuitively with stroke-based non-photorealistic renderings, novel interaction techniques for large displays have been developed. Interaction techniques based on hand postures allow users to expressively explore the creation process of a non-photorealistic painting. 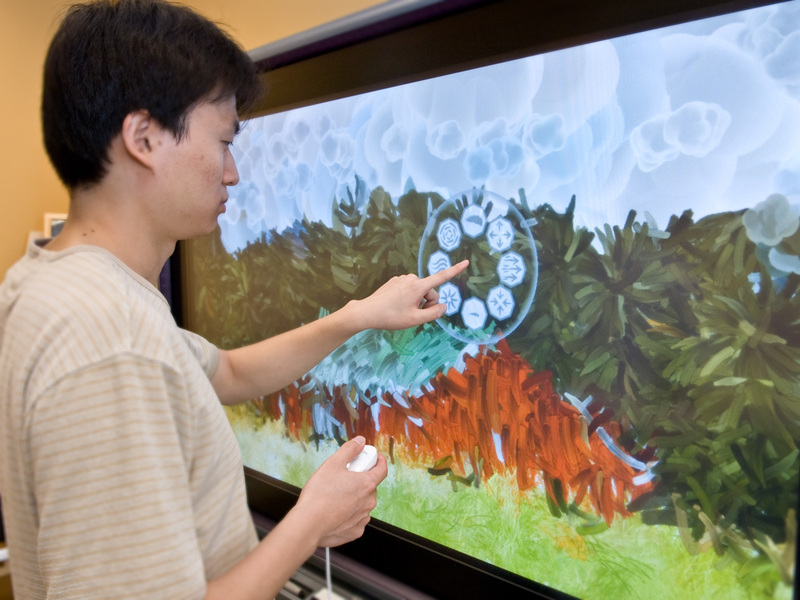 Two bimanual interaction techniques use the Nintendo Wii Remote Controller in conjunction with the Nintendo Nunchuk to allow users a seamless transition between interaction at a distance and interaction up close on large displays. Furthermore, a set of hand postures to interact with stroke-based rendering on touch-sensitive large displays was developed. In contrast to traditional WIMP interfaces, this allows to directly engage with and influence a rendering. The resulting system allows the creation, distribution and manipulation stroke primitives. 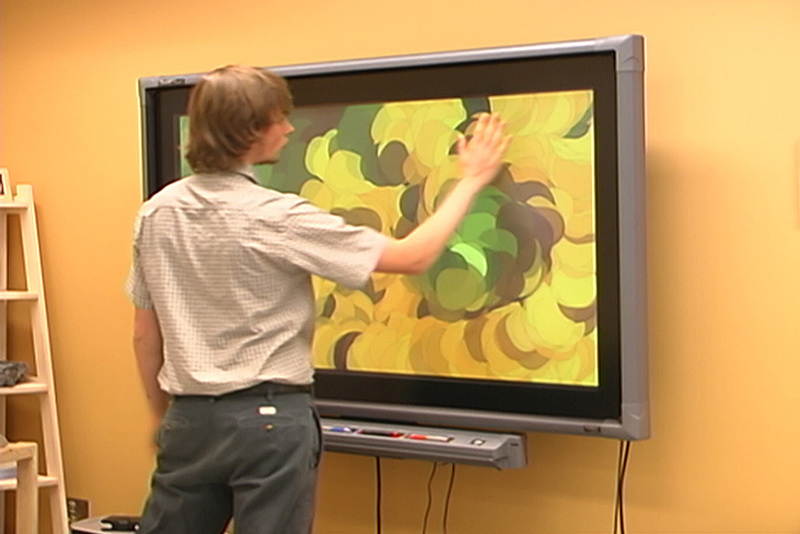 The interaction technique was also used for interactive exploratory visualization of 2D vector fields. Through a set of simple hand postures used on large, touch-sensitive displays, our approach allows individuals to custom-design glyphs (arrows, lines, etc.) that best reveal patterns of the underlying dataset. Interactive exploration of vector fields is facilitated through freedom of glyph placement, glyph density control, and animation. The custom glyphs can be applied individually to probe specific areas of the data but can also be applied in groups to explore larger regions of a vector field. Re-positionable sources from which glyphs—animated according to the local vector field—continue to emerge are used to examine the vector field dynamically. The combination of these techniques results in an engaging visualization with which the user can rapidly explore and analyze varying types of 2D vector fields, using a virtually infinite number of custom-designed glyphs. Bimanual interaction via Direct Touch and the Nintendo Nunchuk. Interaction via a flat hand posture erases image elements gradually. 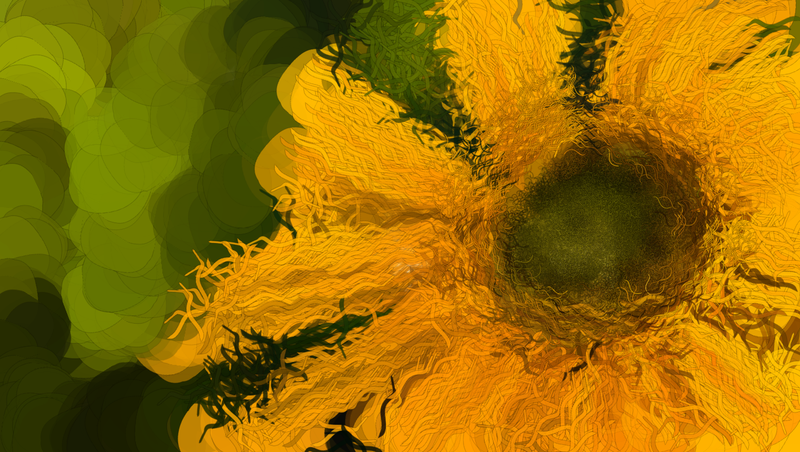 User-sketched primitives enable artists to create a wide variety of 2D shapes. 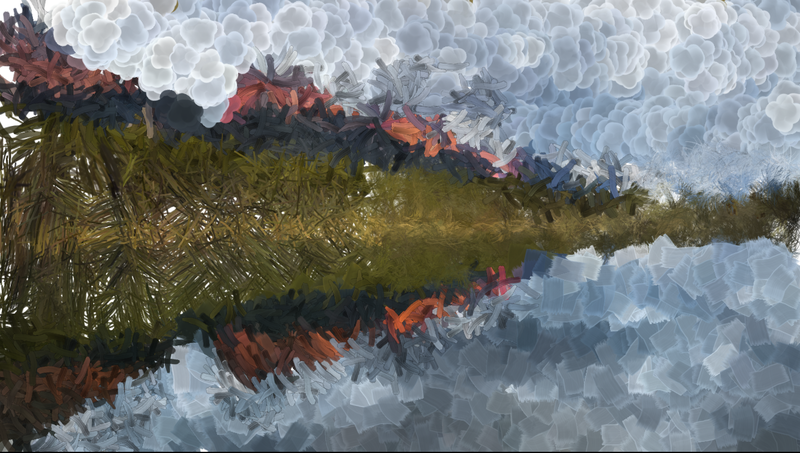 An example image created within 15 minutes with the bimanual interaction techniques. Visualization of storm Emma over Europe, interactively created with our technique. Users jointly exploring a 2D vector field. Jens Grubert, Sheelagh Carpendale and Tobias Isenberg. Interactive Stroke-Based NPR using Hand Postures on Large Displays. In Short Papers at Eurographics 2008, EG 2008 (pp. 279-282). April 14-18 2008, Crete, Greece. Eurographics Association Aire-la-Ville, Switzerland. Tobias Isenberg, Maarten Everts, Jens Grubert and Sheelagh Carpendale. Interactive Exploratory Visualization of 2D Vector Fields. Computer Graphics Forum, 27(3) (pp. 983-990), May 2008. Tobias Isenberg, Jens Grubert, Maarten Everts and Sheelagh Carpendale. Hands-On Analysis and Illustration: Interactive Exploratory Visualization of Vector Fields. In ASCI 2008 Proceedings of the Fourteenth Annual Conference of the Advanced School for Computing and Imaging (pp. 222-229). June 11-13, 2008, Het Heijderbos, Heijen, The Netherlands.